Theisite: Mineral information, data and localities. Named after Nicholas J. Theis, geologist, Bendix Corporation. Rare secondary mineral in fahlore deposits. The crystal structure is unknown. Unlike in the formula suggested in the original publication, the Sb is probably present in octahedral coordination as Sb(OH)6 or Sb(H2O)6 groups. Azurite 80 photos of Theisite associated with Azurite on mindat.org. Claraite 22 photos of Theisite associated with Claraite on mindat.org. Zincolivenite 9 photos of Theisite associated with Zincolivenite on mindat.org. Tyrolite 5 photos of Theisite associated with Tyrolite on mindat.org. Strashimirite 4 photos of Theisite associated with Strashimirite on mindat.org. Malachite 3 photos of Theisite associated with Malachite on mindat.org. 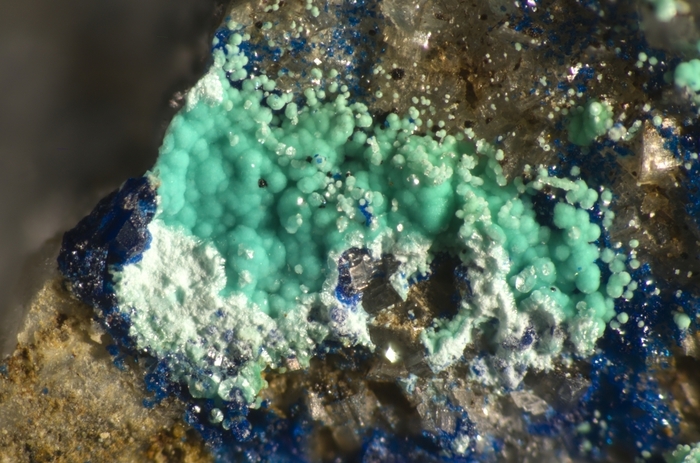 Hemimorphite 2 photos of Theisite associated with Hemimorphite on mindat.org. Brochantite 2 photos of Theisite associated with Brochantite on mindat.org. Cuprian Adamite 2 photos of Theisite associated with Cuprian Adamite on mindat.org. Calcite 2 photos of Theisite associated with Calcite on mindat.org. Williams, S. A. 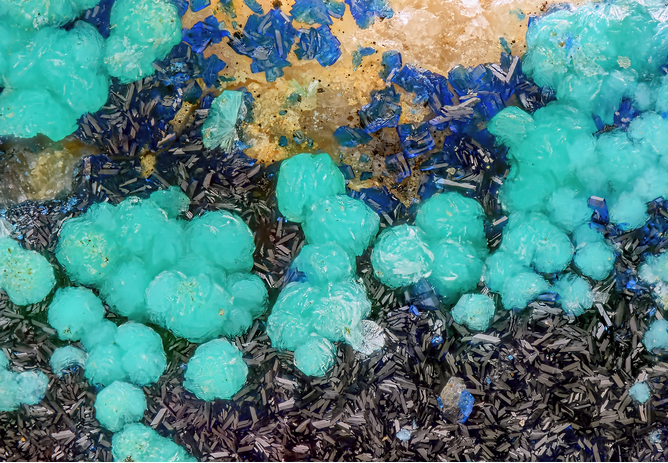 (1982): Theisite, a new mineral from Colorado. Mineralogical Magazine: 46: 49-50. 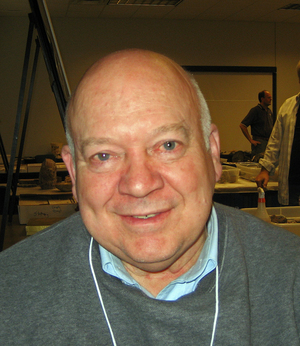 American Mineralogist (1983): 68: 282. European Journal of Mineralogy (1995): 7: 1325. The following Theisite specimens are currently listed for sale on minfind.com. Kolitsch, U., Schachinger, T. & Brandstätter, F. (2010): 1649) Aragonit, Theisit, Zinkolivenit und ein neues Cu-Zn-As-(S)-O-H-Mineral vom Bergbau Ottneralm (Traholz), Brixen im Thale, Salzburg. Pp. 235-237 in Niedermayr et al. (2010): Neue Mineralfunde aus Österreich LIX. Carinthia II, 200./120., 199-260. Brandstätter, F., Niedermayr, G. & Walter, F. (2010): 1635) Alunit, Aragonit, Azurit, Chalkopyrit, Dolomit, Malachit, Tetraedrit und Theisit vom Pengelstein bei Kitzbühel, Tirol. Pp. 222-223 in Niedermayr et al. (2010): Neue Mineralfunde aus Österreich LIX. Carinthia II, 200./120., 199-260.
idem (2005...); Berbain, C., Favreau, G. & Aymar, J. (2005): Mines et Minéraux des Pyrénées-Orientales et des Corbières. Association Française de Microminéralogie Ed., 153-154. - Dondi, M. , Palenzona, A. and Puggioli, G. (1995). "La miniera di Monte Avanza, Forni Avoltri (Udine)." 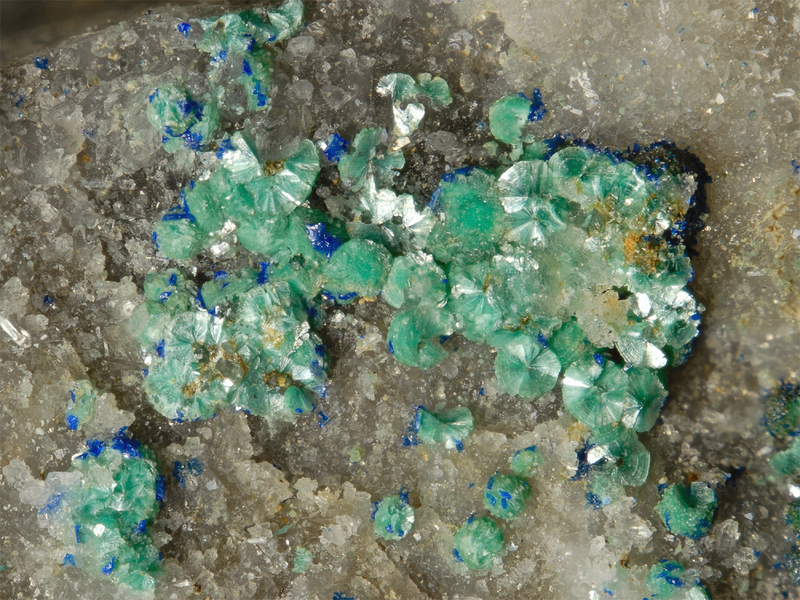 Rivista Mineralogica Italiana,(2), 125-136. Stara P., Rizzo R. and Tanca G.A. (1996): Iglesiente e Arburese. Miniere e mnerali. Vol.I, EMSa (Ente Minerale Sardo), pagg.238. Stalder, H. A., Wagner, A., Graeser, S. and Stuker, P. (1998): "Mineralienlexikon der Schweiz", Wepf (Basel), p. 401.; Cuchet, S., Ansermet, S. & Meisser, N. (2012): Die kupferhaltige Mineralisierung am Six Blanc im Wallis. Schweizer Strahler 46 (4), 2-16 (in German and French). Mineralogical Magazine(1982) 46, 49-50; Minerals of Colorado (1997) Eckel, E. B.